Support Hose Storewould like remind you April is Foot Health Awareness Month. The warm spring weather brings us out of our winter hibernation and we dust off our summer sandals and head out to give our footsies a pedicure. It is time for you to put your feet first and take time to inspect your feet daily and give them the attention they deserve.Each stride the average adult takes puts nearly 1000 pounds per square inch of pressure on the bottom of the feet. It is evident that nearly each one of us will suffer some type of foot pain during our lives. So it is appropriate that we stop and inspect our feet. Are they rough, dry and calloused? What is the appearance of the toe nails-are they discolored or brittle? If yes, perhaps it is time that you schedule an appointment with a qualified podiatrist. Our feet are always there to take us where we need to go. Healthy feet are fundamental to the quality of our daily life. We need to care for them so they are ready to go when we are. Don’t ignore heel pain, toe pain, corns, calluses or bunions! If your feet hurt, something is wrong. It was President Abraham Lincoln who said, “When my feet hurt, I can’t think.” Taking a walk is a great way to help in maintaining your mental and physical well-being. 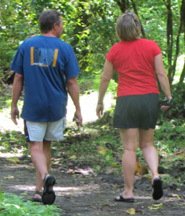 Walking provides the exercise needed to maintain a healthy body weight and increase circulation in the lower extremities. When you walk, wearing support socks and support stockings can help you increase your circulation. Be Sure To Check Our Website For Updates On Our New Web Site Launch Coming In June And Exciting New Products Coming Soon!